On the 16 July 2017, I finally saw my first orca after 24 years of waiting. 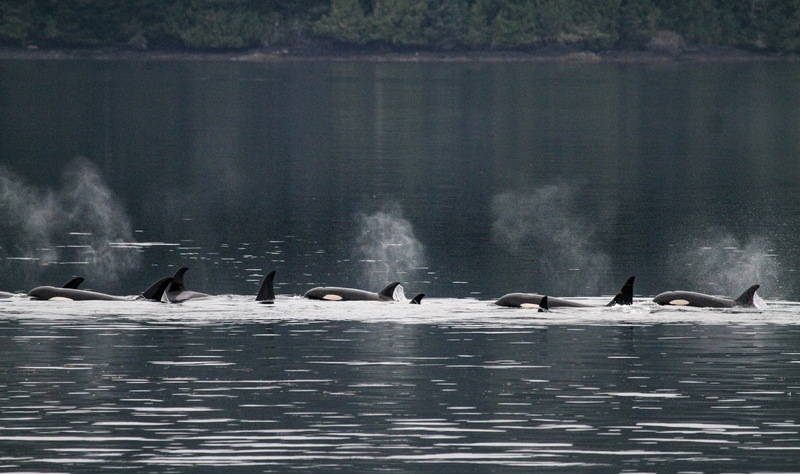 It was a magical moment when the T090s (Bigg's orca, otherwise known as transients) silently swept into Blackney Pass from the south, and travelled past the Lab. To be researching orca in the breath-taking surroundings of British Columbia, Canada is a dream come true: Here’s my account of what life is like here at OrcaLab. It’s been three weeks since I arrived on the woodland shores of Hanson Island, and I still can’t quite believe that I’m here. From the moment I stepped off the boat and onto the rocky slopes outside the Lab, I could tell that this place was quickly going to feel like home. The Lab and surrounding out-buildings are constructed solely from the wood around. It sits on a rocky outcrop, with a wide view of Blackney Pass, which is nestled neatly in the bay and is great for observing passing wildlife. 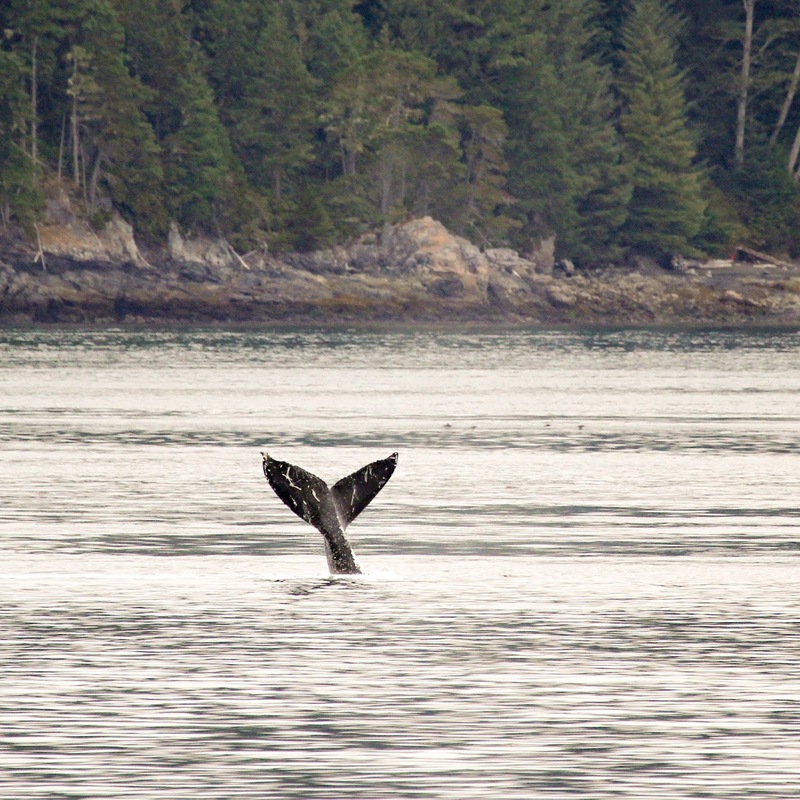 My first week was quiet on the orca front, so we primarily focused on the humpback whales, which are an almost daily guarantee. This gave me a good chance to get acquainted with the procedures in the Lab and the runnings of the camp. 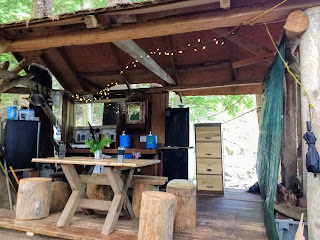 The camp is completely off-grid. We use primarily solar power (with a generator if needed on cloudy days). There is a huge amount of energy required to power all of the equipment, so we use gas for cooking, natural fires for heating, and switch off all electrical equipment that’s not in use. The camp is full of everything you’d need to comfortably live in the wilderness, although perhaps a little more rudimentary than you might be used to. Our kitchen is outdoors with a mismatch collection of utensils fit for all culinary creations. We only get groceries when someone is in Alert Bay (the nearest town on a neighbouring island), once every week or two, so it’s important to learn the art of proper meal planning. Generally, I live off of granola, eggs and peanut butter during the day, with Paul and Helena generously providing our evening meals, (which are absolutely delicious!). The “outhouse” (or toilet) is an open shack in the woods, which takes a while to get used to. The only unnerving moments are when it’s pitch-black and there’s a pair of large, yellow eyes staring back at you from the trees. In that circumstance: Make it quick and hope it’s just a deer! There’s a limited amount of fresh water (drawn from a nearby creek) that we primarily save for cooking and drinking. This means that everyone gets a warm shower about once a week, and the rest of the time we use the ocean. It’s a lot colder than I was expecting (around 7 degrees Celsius) and you really have to force yourself to stay in so you reach that “comfortably numb” stage and the pain disappears! The whole experience is really quite exhilarating. Post-swim, if you’ve been organised, you can warm up in the heated seawater bathtub on the rocks, the sauna in the bath-house, or with a cup of tea snuggled in your sleeping bag. Work here never stops. It takes a monumental effort to keep things running smoothly and Paul, Helena and the volunteers do a fantastic job. Every day there’s wood to be chopped, food to prepare, a garden to maintain, repairs to make, boat trips to the cameras and hydrophones, guests to accommodate - and much more. All assistants pitch in and you soon recognise what needs to be done and when. the island has to offer. The island is very occasionally visited by wolves, bears and cougars - it's safe to say we would all love to encounter these animals (from a safe distance, of course!). We monitor the hydrophones 24/7, which means that there is always someone in the Lab itself. We try to split the shifts so that everyone works an equal number of days and nights. In this way, sleeping patterns can vary. As someone notoriously known as “Snooze”, this has been quite an adjustment for me, but I’m definitely getting into the swing of it three weeks in. I enjoy the variety of early mornings and late nights, and it’s given me a real appreciation for my cosy tent and sleeping bag, which feels like a luxury after being awake all night! 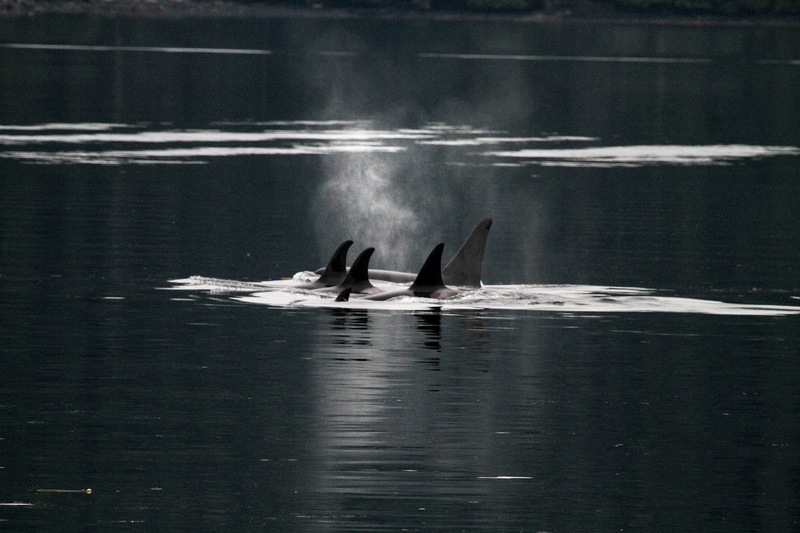 And when you're not in the Lab, you can often hear the orca through speakers located throughout the camp. 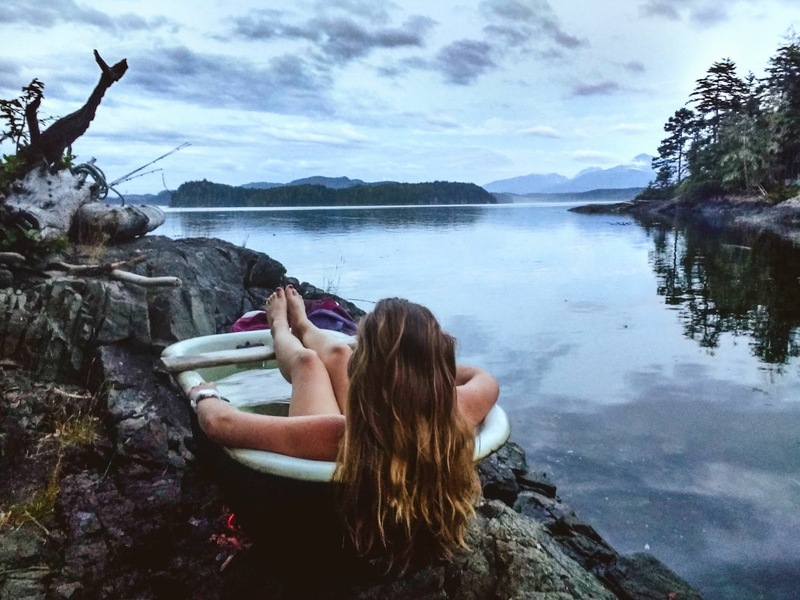 My favourite part of the whole experience is waking up in my tent to the sounds of orca calling through the trees: It is simply magical. The Lab is an impressive feat; built up over the past four decades, it’s every techy's dream. 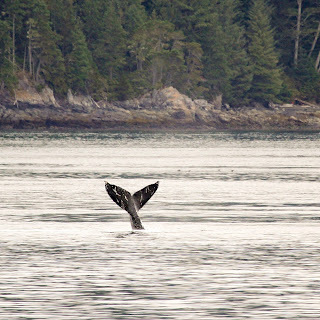 There are currently six working hydrophones covering an area of approximately 50km square between Queen Charlotte Strait and Johnstone Strait. This is a particular “hotspot” for the orcas in the summer months, which means that, once the orca show up, there’s never a dull moment! We live-stream the acoustic data to www.orca-live.net and the video from the network of cameras that can be viewed at www.explore.org. 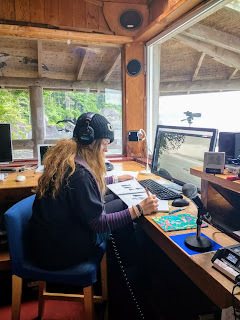 When an orca call is heard, we try to isolate the location of the individual(s) by using a mixer, which feeds all six signals from the hydrophones to our speakers. 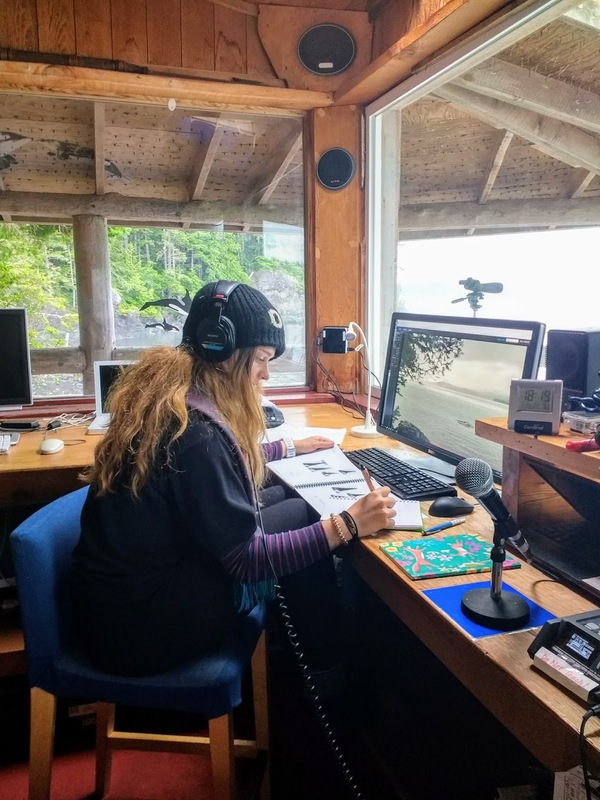 By keeping the channel from the hydrophone that the calls are likely on in the 'centre' position of the mixer, and the others on the 'left' and 'right', we can acoustically map the position of the orca as they pass through the network. During the daytime, there are two people on shift. One in the Lab and one on the deck as a lookout. As soon as orca are seen in the Pass, the cry of “OORRRCCCAAAA!” echoes through the camp and everyone drops what they’re doing and rushes to the deck. Goodness, do the orca keep us busy! We have people on the telescopes to map their location, count them and identify who they are. We have people on both still and video cameras recording footage, and another updating our various social media pages. Inside the Lab, there is always somebody following the orca acoustically, noting everything that can be heard. And two people operate the network of cameras so that the world can watch the orca on the explore.org live-stream. In the past week, the orca have been appearing more frequently, with more and more groups entering the area. So far, we have sighted a few matrilines from the A and G clans of the Northern resident population: the most prevalent being the A30s. The difference between the vocal dialects of the different orca pods is fascinating, and it’s astounding to watch Paul, Helena and the more experienced volunteers identify a group from just a single call. There sure is a lot I still have to learn but one thing is for certain: I absolutely love it here. The team is wonderful and it already feel like I am part of the OrcaLab family. 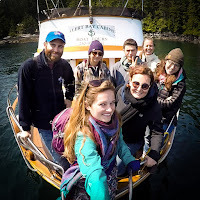 My fellow volunteers are from different parts of the globe and walks of life, but we all have one thing in common: A passion for nature, conservation and, obviously, orca! Paul and Helena’s generosity knows no bounds and it’s clear that they have such a heart for what they do. To be able to contribute to their efforts and the protection of this beautiful population of orca is a truly humbling experience. Bring on the next two months! Keep an eye out for my future blog, where I will be bringing you a "who-is-who" guide to the individuals, matrilines and clans which make up the Northern resident orca population. And in the meantime, to learn more about OrcaLab and its history, read my interview with Dr. Paul Spong here. Unless otherwise credited, all photos © Suzie Hall.